Introduction: The etiology of acute kidney injury (AKI) in hospitalized children is multifactorial. While nephrotoxic antibiotics, such as aminoglycosides, cause AKI, the prevalence and severity of AKI in this context are uncertain. Methods: This prospective observational study enrolled consecutive patients, from 1 month to 12-year-old, admitted to pediatric wards at an academic tertiary care center between March 2013 and March 2014. Included patients had normal renal function at baseline and were treated with aminoglycosides for more than 7 days. Serum creatinine was monitored serially for the development of AKI by pediatric risk, injury, failure, loss, end-stage renal disease (pRIFLE), and AKI network (AKIN) classifications. Data, presented as percentage or mean ± standard deviation, were compared using appropriate tests. Results: Of 100 patients (68% boys) treated with aminoglycosides for 11.4 ± 4.5 days, chiefly for pneumonia, febrile neutropenia and abscesses, 97% received amikacin and 3% received gentamicin, chiefly (84%) in multiple doses. AKI was observed in 46% and 62% of cases using AKIN and pRIFLE criteria, respectively. Patients with AKI were younger than those without AKI (P = 0.04) and received multiple dosing more often than once-daily regimen (P = 0.07). Conclusions: AKI develops in a significant proportion of hemodynamically stable patients treated with aminoglycosides for 7 days or longer. Young age and multiple daily doses are potential risk factors for AKI in patients treated with aminoglycosides. Aminoglycosides are potent broad-spectrum antibiotics chiefly, used to treat severe infections with Gram-negative organisms., While these antibiotics are readily available at reasonable prices and show satisfactory efficacy, their nephrotoxicity limits prolonged and recurrent usage and requires frequent monitoring of renal function. Nephrotoxicity, observed in 10–25% of therapeutic courses,,,, is considered to result chiefly from tubular damage. Aminoglycosides are freely filtered across the glomerulus; about 5%–10% is reabsorbed by the proximal tubular epithelial cells, where they are sequestered into lysosomes in concentrations much higher than their serum concentration. The nephrotoxicity of aminoglycosides is secondary to altered phospholipid metabolism within tubular cells  and manifests as nonoliguric renal failure that is aggravated by the concomitant use of other nephrotoxic drugs. Most of the studies on aminoglycoside-associated toxicity have been conducted primarily in critically ill patients with concomitant factors to aggravate the injury. The present study aimed at detecting acute kidney injury (AKI) in stable hospitalized children treated with aminoglycosides. This prospective, single-center observational study was conducted in the pediatric wards of a tertiary care teaching hospital between March 2013 and March 2014. Following ethical approval and written informed parental consent, all consecutive patients admitted to the pediatric wards in the hospital were enrolled if they were aged between 1 month and 12 years, had normal renal function at admission in pediatric wards, and received aminoglycosides for at least 7 days for the first time in the current illness. Patients with known chronic kidney disease and/or impaired renal function at admission were excluded from the study. Information was collected on demographic characteristics, diagnosis, comorbidities (sepsis, hypotension and ventilation), concomitant use of other nephrotoxic drugs (radiocontrast agents, glycopeptides, amphotericin B, nonsteroidal anti-inflammatory drugs, angiotensin-converting enzyme, angiotensin receptor blockers and cyclosporine) and dose, duration, and type of aminoglycoside used. Evaluation included physical examination, anthropometry and serum biochemistry. Three ml of venous blood was collected at baseline, 48 hr, and twice a week until the completion of aminoglycoside therapy, for the estimation of serum creatinine (by modified Jaffe's technique) and albumin using an automated analyzer (Beckman Coulter). Patients received specific and supportive treatment for the underlying condition according to unit protocols. 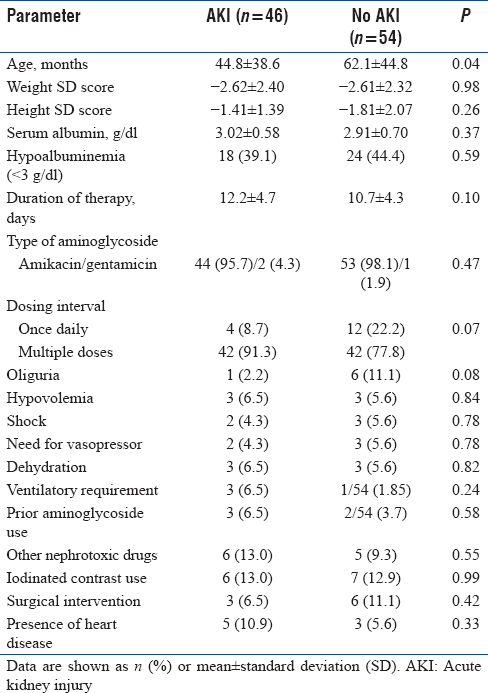 Aminoglycosides were prescribed in multiple doses (amikacin at 7.5 mg/kg/dose or gentamicin at 2.5 mg/kg/dose) or as once-daily dose (amikacin at 15 mg/kg or gentamicin at 5 mg/kg) and adjusted for estimated glomerular filtration rate below 60 ml/min/1.73 m2, if required. Data are presented as number (percentage) and mean ± standard deviation (SD) and compared using appropriate tests. Based on an estimated prevalence of AKI of 25%, a sample size of 75 patients was required to examine the prevalence of AKI in our patients with 95% confidence and absolute precision of 10%. We enrolled 100 patients to account for loss to follow-up and for change of antibiotics or death within 7 days. Of 100 patients enrolled 68 (68%) were boy, with a male-to-female ratio of 2.1:1. The mean age was 53.9 ± 42.8 months; 59 children were below 5 years of age. Their weight and height SD scores were −2.61 ± 2.18 and −1.63 ± 1.79, respectively. Serum albumin at baseline was 2.96 g/dl; 42% patients had hypoalbuminemia (serum albumin <3.0 g/dl). Aminoglycosides were administered for 11.4 ± 4.5 days; amikacin was the most commonly used aminoglycoside (97%). Most patients received multiple doses (twice a day in 40% and thrice a day in 44%); 14% received aminoglycosides once a day. Chief indications for aminoglycoside administration included lower respiratory tract infections (31%), febrile neutropenia (17%), liver abscess (14%), cellulitis (7%), abscesses at other sites (5%), dysentery (5%), urinary tract infections (4%) peritonitis (4%), and sepsis (3%). Eleven patients received concomitant other nephrotoxic drugs. There was a trend for an increase in serum creatinine level from baseline to values on day 10, with a significant change from baseline on days 4, 7, and 10 [Table 2]. The GFR, estimated using modified Schwartz formula, showed corresponding decline. AKI was detected in 46 patients using the AKIN classification, with AKI Stages 1, 2, and 3 in 47.8%, 41.3%, and 10.9% cases, respectively [Table 3]. Using the pRIFLE criteria, AKI was identified in 62 patients, of which 50% were classified in “risk” category, 46.8% had “injury,” and 3.2% had “failure.” Kappa score for the level of agreement between pRIFLE and AKIN criteria was statistically significant at 58.2% [P< 0.001; [Table 4]. Comparison of patient characteristics between those who developed AKI and those who did not, showed that patients in the AKI group were younger [mean age 44.8 months vs. 62.1 months; P = 0.04; [Table 5]. There were no significant differences between the two groups when compared for the presence of oliguria, hypovolemia, shock, use of vasopressors, requirement of mechanical ventilation, prior use of aminoglycosides and use of other nephrotoxic agents [Table 5]. Compared to patients without AKI, patients with AKI had a longer duration of aminoglycoside use and more often received multiple doses (rather than one dose) per day; however, these differences were not significant. Of the 100 noncritically ill patients administered aminoglycosides for 7 days or longer, 98% were discharged with recovery or improvement. Two patients died during hospital stay due to causes not attributable to AKI. In the present study, AKI was observed in 46% and 62% of patients using the AKIN and pRIFLE criteria, respectively. This incidence is higher than in previous reports. A retrospective study in stable children treated with aminoglycosides found AKI in 19.6% of cases by AKIN criteria and in 33% of cases by the pRIFLE criteria. In a prospective, observational cohort study on 373 adults with infective endocarditis, Buchholtz et al. found that the estimated endogenous creatinine clearance declined by 8.6% among patients receiving gentamicin and increased by 2.3% in patients not treated with aminoglycosides. AKI was identified in 22% of patients with cystic fibrosis treated with aminoglycosides in another retrospective study. Possible reasons for difference in incidence as compared to past studies might be variations in definition of nephrotoxicity; the use of threshold values of serum creatinine may underestimate AKI incidence. Lack of baseline serum creatinine and reliance on detecting change in creatinine during the hospital stay might be the additional source of bias causing underestimation. The higher incidence of AKI in the present study may be explained by the practice of multiple dosing (twice or thrice daily) in most of our pediatric units, which is suspected to be associated with AKI more often than once-daily dosing.,,, Compared to once-daily dosing, patients receiving multiple daily doses had higher odds of developing AKI both by AKIN (odds ratio 3.5) and pRIFLE (odds ratio 2.6) criteria. A high proportion (42%) of our patients had hypoalbuminemia, known to be associated with high-peak aminoglycoside levels and predispose to aminoglycoside-associated nephrotoxicity., The high prevalence of malnutrition might have contributed to nephrotoxicity through hypoalbuminemia. However, patients with or without AKI did not differ in the anthropometric parameters or prevalence of hypoalbuminemia. Our inability to monitor trough aminoglycoside levels due to lack of facilities may have aggravated the nephrotoxicity. The comparison between proportions of AKI detected by pRIFLE and AKIN criteria showed that pRIFLE criteria were more sensitive in detecting AKI as compared to AKIN; however, AKIN criteria identified more patients with severe disease [Table 3]. In a prospective cohort study on 1489 children undergoing cardiac interventions, AKI was detected in 20%, 34%, and 29% of patients according to the AKIN, pRIFLE, and KDIGO criteria, respectively, indicating that pRIFLE criteria are most sensitive while the AKIN classification is more specific in detecting high-risk patients across all age groups. A high level of agreement (kappa) between the pRIFLE and AKIN criteria in our study is similar to the value observed in a previous study by Zappitelli et al. Serum creatinine showed a rising trend from baseline to values on day 4, 7, and 10, confirming findings from previous studies that AKI associated with aminoglycoside use occurs around 6–10 days from the start of therapy. However, AKI was transient and almost all patients recovered from AKI. Patients with AKI differed from those that did not develop AKI in being significantly younger, suggesting an increased susceptibility to nephrotoxicity at young age. The lack of association with traditional risk factors for AKI, such as hypovolemia, use of inotropes, mechanical ventilation, and concomitant nephrotoxic agents, may be explained by the small numbers exposed to these risk factors as the study was conducted in predominantly stable patients admitted to pediatric wards. AKI is observed in a substantial proportion of stable patients treated with aminoglycosides for a week or longer. Younger children and those on multiple dosing of aminoglycosides are more prone to renal injury. The presence of malnutrition or hypoalbuminemia may exacerbate the nephrotoxicity, particularly in the absence of drug monitoring. This report emphasizes the need for caution when aminoglycosides are prescribed for prolonged periods in children. Andreoli SP. Acute kidney injury in children. Pediatr Nephrol 2009;24:253-63. Hoog MD, Van der Anker JN. Aminoglycosides and glycopeptides. In: Yaffe JS, Aranda JV, editors. Neonatal and Pediatric Pharmacology: Therapeutic Principles in Practice. 4th ed. Philadelphia, PA, USA. : Lippicott Williams & Wilkins; 2005. p. 377-401. Mingeot-Leclercq MP, Tulkens PM. Aminoglycosides: Nephrotoxicity. Antimicrob Agents Chemother 1999;43:1003-12. Zappitelli M, Moffett BS, Hyder A, Goldstein SL. Acute kidney injury in non-critically ill children treated with aminoglycoside antibiotics in a tertiary healthcare centre: A retrospective cohort study. Nephrol Dial Transplant 2011;26:144-50. Oliveira JF, Silva CA, Barbieri CD, Oliveira GM, Zanetta DM, Burdmann EA, et al. Prevalence and risk factors for aminoglycoside nephrotoxicity in Intensive Care Units. Antimicrob Agents Chemother 2009;53:2887-91. Buchholtz K, Larsen CT, Hassager C, Bruun NE. Severity of gentamicin's nephrotoxic effect on patients with infective endocarditis: A prospective observational cohort study of 373 patients. Clin Infect Dis 2009;48:65-71. Kiatchoosakun P, Kosalaraksa P, Jirapradittha J, Taksaphan S, Tassniyom S. Once-daily gentamicin dosing of 4 mg/Kg/dose in neonates. J Med Assoc Thai 2005;88:934-8. Bellomo R, Ronco C, Kellum JA, Mehta RL, Palevsky P; Acute Dialysis Quality Initiative Workgroup. Acute renal failure-definition, outcome measures, animal models, fluid therapy and information technology needs: The Second International Consensus Conference of the Acute Dialysis Quality Initiative (ADQI) Group. Crit Care 2004;8:R204-12. Mehta RL, Kellum JA, Shah SV, Molitoris BA, Ronco C, Warnock DG, et al. Acute kidney injury network: Report of an initiative to improve outcomes in acute kidney injury. Crit Care 2007;11:R31. Schwartz GJ, Brion LP, Spitzer A. The use of plasma creatinine concentration for estimating glomerular filtration rate in infants, children, and adolescents. Pediatr Clin North Am 1987;34:571-90. National Nutrition Monitoring Bureau (NNMB) NNMB Reports 1979-2006, Hyderabad: National Institute of Nutrition. Available from: http://www.nnmbindia.org. [Last accessed on 2018 May 31]. National Family Health Survey (NFHS-3). Available from: http://www.mohfw.nic.in/nfhsfactsheet.html. [Last accessed on 2018 May 31]. Downes KJ, Patil NR, Rao MB, Koralkar R, Harris WT, Clancy JP, et al. Risk factors for acute kidney injury during aminoglycoside therapy in patients with cystic fibrosis. Pediatr Nephrol 2015;30:1879-88. Sung L, Dupuis LL, Bliss B, Taddio A, Abdolell M, Allen U, et al. Randomized controlled trial of once-versus thrice-daily tobramycin in febrile neutropenic children undergoing stem cell transplantation. J Natl Cancer Inst 2003;95:1869-77. Munckhof WJ, Grayson ML, Turnidge JD. A meta-analysis of studies on the safety and efficacy of aminoglycosides given either once daily or as divided doses. J Antimicrob Chemother 1996;37:645-63. Kiel PJ, Lo M, Stockwell D, Patel GP. An evaluation of amikacin nephrotoxicity in the hematology/oncology population. Am J Ther 2008;15:131-6. Uijtendaal EV, Rademaker CM, Schobben AF, Fleer A, Kramer WL, van Vught AJ, et al. Once-daily versus multiple-daily gentamicin in infants and children. Ther Drug Monit 2001;23:506-13. Gamba G, Contreras AM, Cortés J, Nares F, Santiago Y, Espinosa A, et al. Hypoalbuminemia as a risk factor for amikacin nephrotoxicity. Rev Invest Clin 1990;42:204-9. Contreras AM, Ramírez M, Cueva L, Alvarez S, de Loza R, Gamba G, et al. Low serum albumin and the increased risk of amikacin nephrotoxicity. Rev Invest Clin 1994;46:37-43. Lex DJ, Tóth R, Cserép Z, Alexander SI, Breuer T, Sápi E, et al. Acomparison of the systems for the identification of postoperative acute kidney injury in pediatric cardiac patients. Ann Thorac Surg 2014;97:202-10.